Now an Easter cake, this was originally given by servant girls to their mothers when they went home on Mothering Sunday. A fairly rich fruit cake, it is covered with almond paste or marzipan, often stamped with the figure of Christ and decorated with 11 marzipan balls to represent the 11 apostles (excluding Judas). In the UK Mother's Day or Mothering Sunday is on the 3rd of April this year (2011). Mothering Sunday (or Mother's Day as it is called today) is not a fixed day because it is always the middle Sunday in Lent (half way between Shrove Tuesday and Good Friday). It is a day to celebrate with your mum or the woman who raised you and cared for you. One of the best ways to celebrate is to give them the day off. That means a break from looking after you! You could make breakfast, do some washing, vacuum the house, do some shopping, you get the idea. Flowers, chocolates and cards are the usual thing Mums get to show them you appreciate them, whatever you can afford and what Mum would like are fine. In Victorian times, it was a day when children, mainly daughters, who had gone to work as domestic servants were given a day off to visit their mother and family. It began as a day when they could return home for the day to visit their mothers "gone a mothering" and they often took a cake they baked themselves, called a "mothering cake", or Simnel cake. This rich fruit cake was said to test their skills as a cook. If it remained moist and maintained its taste until Easter Sunday, then they were good cooks. The word simnel comes from the Latin word simila which means fine flour, although it's flavor is derived mostly from the generous addition of spices and fruits - most particularly the layer of almond paste that runs through the center of the cake and the bitter-sweet taste of roasted almond paste. It is decorated with eleven small balls of almond paste - made to signify all the apostles, except Judas. He betrayed Christ and lost his right to be counted among their number. Traditionally these cakes were also decorated with fresh flowers, although these days most cooks use crystalised or edible flowers - such as violets and primroses - or fluffy chicks and colored eggs. 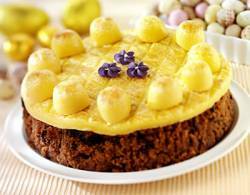 Some simnel cake recipes call for a layer of white glaze icing which is spread on top of the baked almond paste when it has cooled. It is a cake recipe which can trace its history back through many centuries. Preheat oven to 350 degrees F/180 degrees C. Butter an 8-inch springform pan and line pan with buttered wax paper. In a large bowl cream butter and sugar until light and fluffy. Beat in eggs, one at a time. Re-sift flour with salt and add gradually to mixture. Fold in currants and lemon and orange rinds, dredging them in a little flour. Pour half the batter into prepared springform pan. Roll out enough almond paste to make an 8-inch round circle, and put over batter and pour remaining batter over almond paste circle (may be made in 3 layers with two layers of almond paste, if desired). Bake in preheated oven for 1 hour or until cake is golden and springs back when touched. Ice cake with Almond Buttercream Icing (see recipe below) or roll out another 8-inch round almond paste circle for the top. If desired make 11 marzipan balls for decorating the top of the cake and tie a ribbon around the outside of the cake to enhance its look, if you wish. You may also decorated the top of the cake with edible flowers, fluffy chicks or small colored eggs. Pound the almonds, sugar and egg whites until they are smooth; flavor with almond extract. Keep in an airtight container. Use in baking as directed in recipes. Almond Paste may also be purchased in cans or tubes. Add 1 cup confectioners' sugar, a few drops of any desired flavoring, and a drop or two of food coloring to 1 cup of almond paste. Place on a cold surface and knead 15 to 20 minutes. Mold into desired candy shapes or spread over cakes before icing. Makes 1 3/4 cups almond paste. Beat butter and 1 cup confectioners' sugar at low speed with an electric mixer until blended. Add remaining sugar alternately with milk, beating until blended. Add extracts and beat at medium speed until spreading consistency. Makes about 3 cups icing. Roll marzipan or almond paste into 11 walnut sized balls and place around top edges of cake for decoration. This was delicious. I'm putting it in our Family Recipe Book, I'm not going to change a thing. Fantastic cake, wonderful other recipes and an excellent history lesson. Thank you. I never knew about this and am glad to have found this. Plus I have passed it around to family and friends, who equally love it.